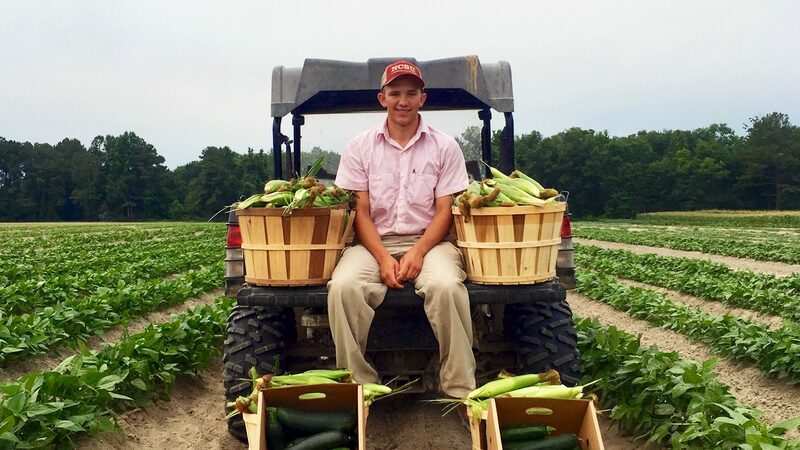 Collin Blalock has always been ahead of the curve: He’s known where he wanted to go to college since childhood, and he started his own produce business at age 15. Now a rising sophomore majoring in agricultural science, Blalock talked to us about his first year at NC State and how the College of Agriculture and Life Sciences is shaping him as an entrepreneur. Why did you choose College of Agriculture and Life Sciences? Choosing to come to NC State, and more specifically CALS, was an easy decision for me. I was raised in an NC State farming family, and now I’m able to go to the school I have always loved and also further my education in an industry I have a strong passion for. To return to my family farm, and to continue my produce business that I started five years ago. My dad gave me the idea of growing produce to sell when I was 15 years old, so I started Collin’s Produce. From there, it kept increasing in size and I fell in love with it. I started out my first year just selling to people in my community, then eventually supplying grocery stores, farmers markets, the public, and restaurants. I hope to continue this on a larger scale after graduating. I am working on my family farm, trying to learn as much as possible from my dad and other farmers in the community. I want to get an early start so that when I graduate, I will have already gained a lot of knowledge. With my produce business, I am trying to increase in size every year and see where it leads me. Having to make business decisions for myself and being able to tend to my crops has taught me a lot. I have loved the connections, opportunities and lessons I have been given through my business. What have you learned that you will take with you when you graduate? I have learned so much in just one short year at NC State. The Crop Science and Ag Business classes have really been a huge help to me and my farm back home. They got me thinking of better ways to grow my crops and handle my business. Tell me about an NC State experience you’ve had outside the classroom. My favorite experiences outside the classroom are football games at Carter Finley Stadium. Ever since I was little, my parents and I would go to all the home games. I would always look at the student section, and I couldn’t wait till I could be a part of it. Now being a student at State, football games mean even more – there is nothing better than spending a Saturday with your friends watching some Wolfpack football. Connections between students and staff.